I personally completed my ravelympics training. I couldn’t be more ready. I do not typically swatch carefully, and I have never washed and blocked a swatch. This has not often been to my detriment, though once in awhile I get burned. For the most part, I find I’d rather frog and reknit than swatch in the first place. Call me crazy, I know! I figured though, that for an event where a deadline was key, I had really better carefully swatch as to not lose time with a reknit. 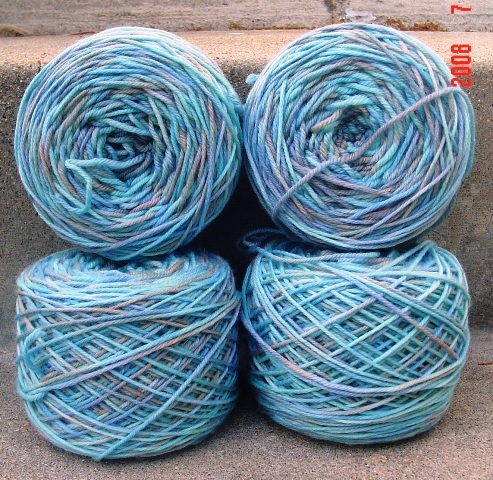 Also, I’ve been hearing rumors about the yarn I chose, it apparently likes to expand upon contact with water. So I did actually wash this one before I checked my gauge. I am a chronically loose knitter, going down at least 2 needle sizes to achieve proper gauge, and this was no exception. 2 needle sizes down and I had the exact gauge that was called for. How cool is that! Yes, I am just a little excited over this new experience! I figured I’d show you, partly because this indicates how the yarn will knit up colorwise as well. I have to say, this one is going to be purdy! Very soft and subtle and I think it will look nice over a dark top in the winter. Sarah on both scarf stroke and laceweight longjump. Phyllis on shawl relay and just in case we don’t think she is crazy…hat dash too! And we may have one other competitor, Carrie, who will be our WIP wrangler. What is even better is, these gals have agreed to allow me to post their projects and progress here on my blog as well as ravelry, so we get to enjoy those projects all in one place! I’ve been keeping myself on a tight schedule of knitting socks lately, as I have 2 pair I would like to get done before ravelympics, and one of them has a deadline of August 3. But…as you know by now, project monogamy is not really my strong suit. So I couldn’t resist sneaking a couple other things in as well. Don’t worry, deadline socks are coming along quite nicely even so and I am sure I can finish them. Here is 242 yards of black BFL from Gale’s art. The muted colors in this are rather a change for me, but I love them! It is what attracted me to the roving in the first place. I had begun spinning it months and months ago but let it get put aside in interest of finishing the lite lopi sweater. 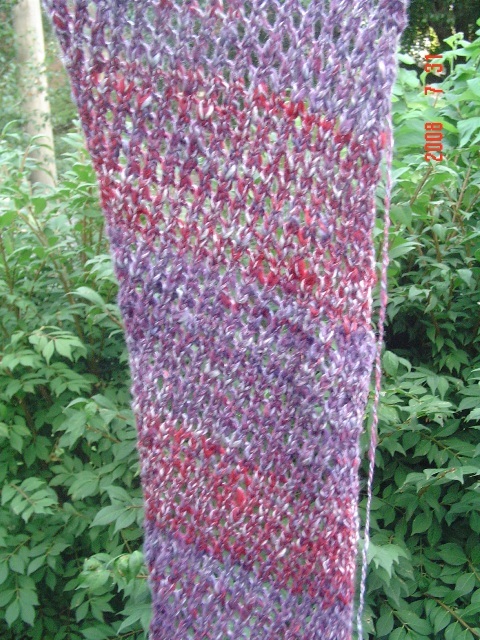 The other one I’ve been sneaking rows in on is the handspun montego bay scarf. It is knitting up quite quickly and I love how it looks! OK, thats it, no more sneaky knitting until Nicks socks are done! I didn’t even know I did it, but someone believes I did. Today, while at work, I got a call on my cell phone. Me: Hello, can you please identify yourself. Caller: You keeked mah dug. Caller: You keeked mah dug! You keeked mah dug, I saw you! Me: Ma’am, you have the wrong number. Caller: I do not, You keeked mah dug, You came on mah property and you keeked mah dug! Me: (sort of laughing) Um, who is this, please identify yourself, I assure you I did not kick a dog today. Caller: Yes you did! I saw you keek mah dug! Me: Who is this! (at this point I am wondering if this is a prank call from a crazy friend, but I don’t know anyone who has such an accent OR who has a similar intonation and timbre. Caller: THis is frufru’s mother, you keeked mah dug! At this point I hand the phone over to favorite coworker, because I am laughing too hard. Favorite coworker: Who is this? Caller: You keeked mah dug! Favorite coworker: Please verify your number, I assure you she would NEVER kick a dog! Favorite coworker: You have the wrong number. Lady, you are crazy! She hands the phone back to me. Woman is still going on about her dog so I hang up. All I have to say…..with a name like FruFru, even though I never kicked her dog, I want to now! 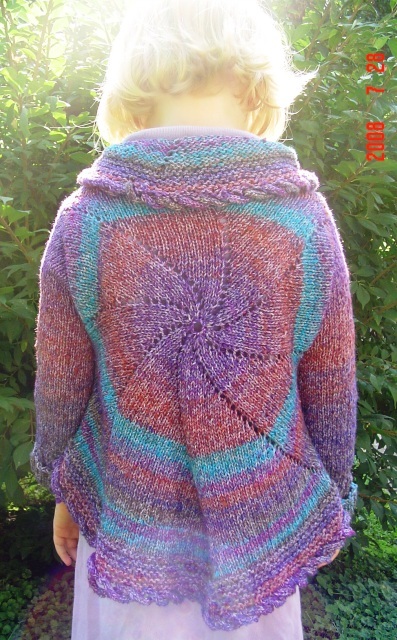 Bug is proud to present her pinwheel sweater. She, contrary to how she looks, was none too pleased to be wearing a sweater in this heat either! Done in Noro Matsuri. This was a good yarn for the sweater, it makes a lighter fall sweater rather than heavy wool for the winter. 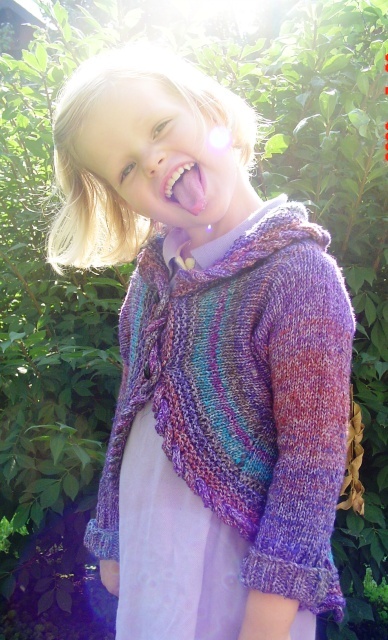 The noro had lots of knots so there were tons of wonderful color changes. Bug: Mommy, what is this building on my shirt? Is it a church? Me: No sweetie, that is the Eiffel Tower. Bug: Oh, where is it? Bug: Oh, do people live in it? Me: No Love, but they can go in it and look out of the top, way high up, and see the whole city. Bug: OK. Someday, can we go there? And another travel dreamer is born. As promised, my wheel sat idle until I got my hands on the Sanguine Gryphon handpainted 65% merino, 35% silk Ravenswood roving for Savasana. 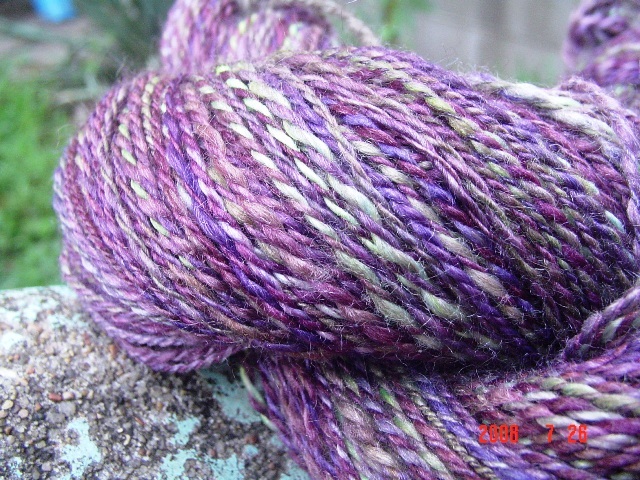 Now, this one was a real stretch for me, as I know Sav likes her handspun all barberpoled with the colors mixing together. So, for the first bobbin I tore the roving into 4 long strips and spun from that. For the second bobbin, I had Bug help me mix up all the colors and tear it into thinner strips. Something really amazing that I did not expect happened. 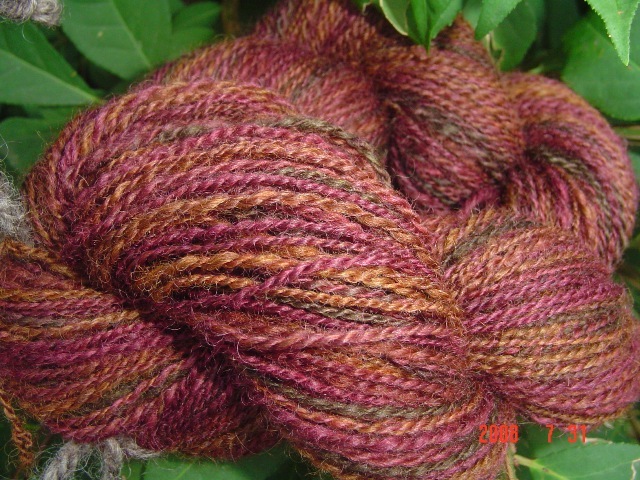 The first bobbin, due to the nature of the handpaint, muddied up the color into a very tweedy thing. 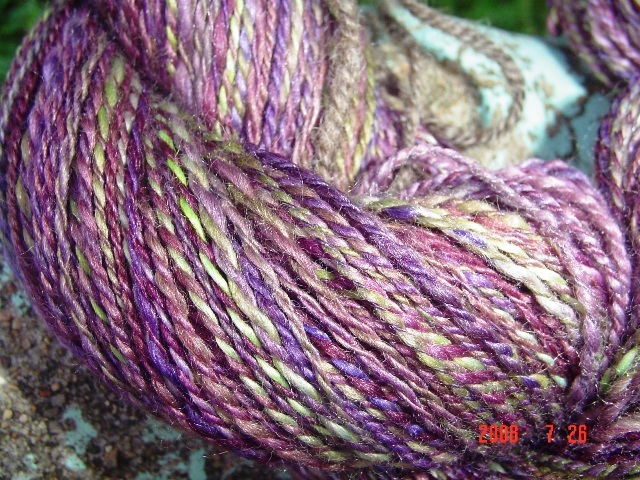 The second bobbin, since I tore it into thinner strips, had color that stayed very saturated and separate. 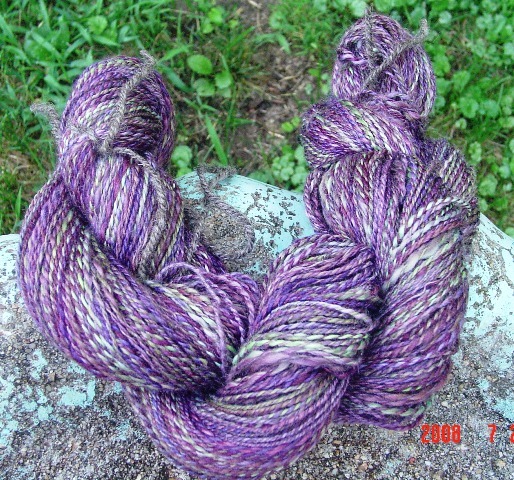 In the end, I feel like I got more colors out of one roving because of this. Now, what you are seeing is not washed and finished, as I am going to let Sav do that herself in interest of trying to get the package out today. But you get the idea. Ravelympics. Where ravelers pick a challenging project to cast on during the opening ceremonies with the attempt to complete before closing ceremonies, thus, competing. Rule is that it must be a challenging project, but not unattainable. How about I knit a sweater in 17 days? 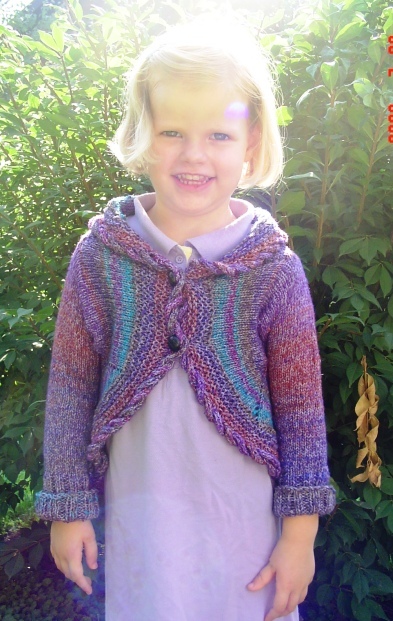 The fastest I have ever knit a sweater was the Starmore Aran sweater I knit for J last year, in a month and a half. I’ve wanted to knit the February Lady Sweater for quite some time now, but felt that I had too many projects rolling around in my brain to start. I suspect that making a sweater in 17 days might be a challenge, but since opening ceremonies start during my vacation, and 2 of those days will be car or plane rides, I think I could manage it. So I will compete this year, in the Sweater Sprint. Swatching before opening ceremonies is considered “training” so that will be done ahead of time, probably when I finish Bug’s pinwheel sweater. Games commence during opening ceremonies Beijing time. I will be on the east coast at that point, so I can cast on at 8 AM on 8-8-08. Shall we look at my gear? Dream in Color Classy, Beach Fog. Appropriate name considering where I will be when I cast on.